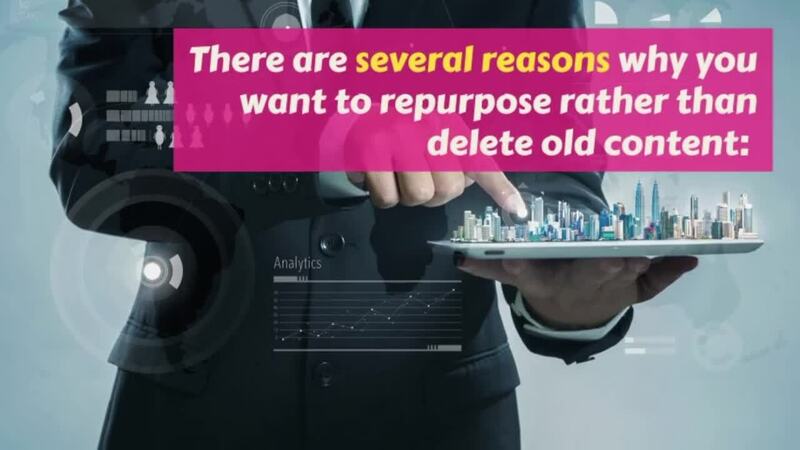 Many people hesitate to repurpose content, for fear that the topic is out of date or that it will displease their audience. But really, you can view it as a second chance. Take content that may not be performing up to your expectations and transform it into a knockout piece. You can even take content that has performed very well in the past and give it new life by changing up the format or expanding the content to include more helpful suggestions. What is repurposing content and why is it important? Repurposed content is content that is older but has been updated or recycled to be used again, possibly in a different format. This could be a blog post that is out of date and needs freshening, or an eEbook, whose information could be used for a video. Its age is valuable to your SEO ranking. It can be used to attract new audiences. Repurposing your content is often more affordable than creating new content. How Should You Get Started Repurposing Content? Before you can begin deciphering which content to repurpose, you should have a solid idea of what content is in your archive. Depending on how long you've been creating content, this could be extensive. What content is out of date? What content could use some additional information? What content is still relevant but could use a little polish? What holes are there within your content that you could fill with new content? Once you've determined what content you have at your disposal, you're ready to craft a plan to repurpose it. Does your content contain dates or figures that are out of date? Get the most current information. If your content is based on statistics that are over 5 years old, for example, it's time for a refresh. Apart from updating old statistics and data, you can also improve your content with additional advice and insight. Instead of a post on 10 ways to improve small business finances, why not make it 15? This will give your past audience new motivation to reread the content. Not to mention making it more attractive to new readers. If you don't plan to change the content format, then you want to give it a fresh look so that people feel like they're having a new experience. People don't want to feel like they're having leftovers -- but the way you present it can make it feel like a gourmet meal. Change the images including the feature image. Include an editor's note in the beginning that notes the update. Now let's check out 10 powerful ideas to guide you in repurposing content. Ebooks are a great way to get more leads and also build your reputation as a thought leader. Despite what you may think, ebooks aren't as complicated as they may sound. No doubt, you probably already have a library of content that could seamlessly become a 40- or 50-page eBook. Got a blog post that has performed really well? If it's a numbered (i.e., 10 Awesome Ways to Make Your Servers More Secure) then make it into a handy checklist that your audience can use on the go. Checklists are fairly easy to make -- after all, you already have the content, you just need to organize it as a checklist. Video is one of the most popular content formats out there. But video doesn't have to be drawn-out, complicated affair. There are several services that aim to help you create video from your already existing content, such as Lumen5. Do you have content, such as a report, that relies on data, figures, and statistics? This kind of content makes excellent material for an infographic. Break down that heavy data with colorful visuals and bold headlines that will help your audience digest the information easier. Have a blog that is doing really well, but want to make it more accessible to your social media audience? Take the content and make it more sharable on social media. Create a visual that highlights the basic information or animates certain key points. You may have several posts, or maybe even a long-form post or eBook, that would make a great outline for a webinar. Include additional points that would add value for your audience. For example, if you notice your readers enjoy your posts on small business tax deductions, you could create a small webinar that covers the nuts and bolts of tax preparation for small businesses, and promote it during tax season. Take content that has done well in the past and use it as talking points for a live video on social media. Both Facebook Live and Instagram Stories are great platforms for this kind of content. Afterwards, transcribe the video to use for your newsletter or Ebook. If you find a blog post which has outdated information or is a couple of years old, don't be too quick to hit delete. You can reinvigorate it, or even completely revamp it, with new information. Update any outdated information, give it a fresh look, and include additional information that will make it more valuable. SlideShare is a great tool, especially for B2B businesses. Take a how-to post, listicle, or eBook and break it into easily-digestible snippets that will go well on slides. Add in a few colorful and relevant images, and you've got yourself the makings of a great SlideShare. Depending on how much content you've created over the years, you might have enough topics and information to do your own podcast. If you've enjoyed this post, we hope you'll also relish this video we've created! You never know what gem you have until you start wiping away the dust and seeing what's under the surface -- you might just have the '68 Mustang of content hidden away in your archives! What tactics have you used to repurpose content? Let us know in the comments below.